We were lucky enough to purchase an amazing resource from the Stern & Faye collection when we were at Wayzgoose a couple months ago. It's been crazy around here this summer, (as you know) so we haven't had a chance to photograph and blog it - but today's the day! 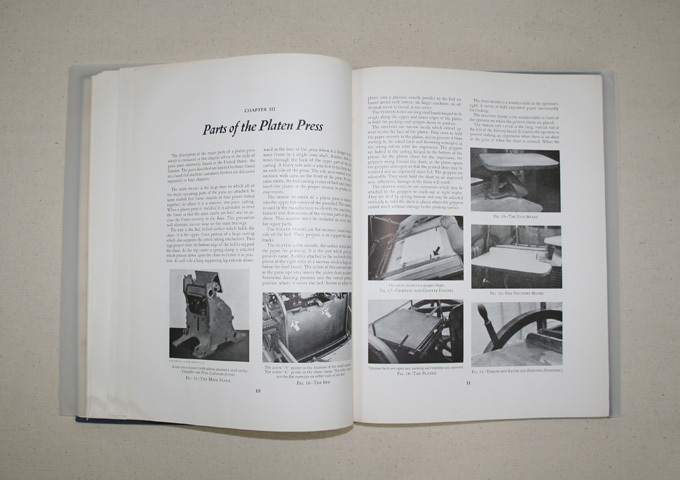 This is the 1953 edition of the informational and inspirational book: Platen Press Operation by George J. Mills. 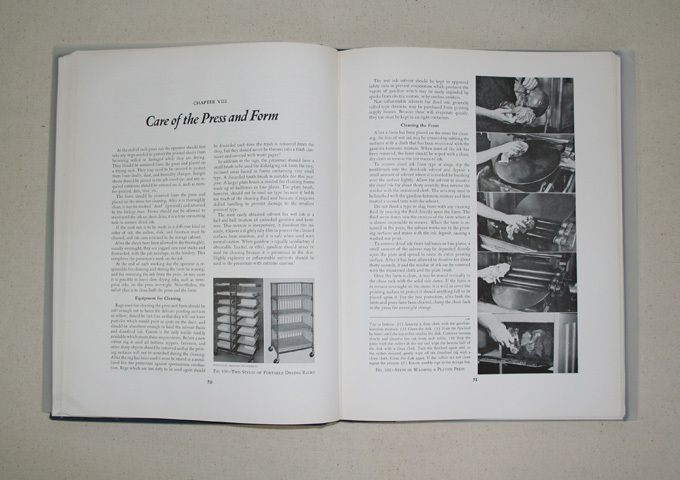 In '53, Mills was the Assistant Professor in the School of Printing Management, Carnegie Institute of Technology. Think about that for a moment. In 1953, lots of people (and by people, I mean men) went to school and majored in letterpress printing. This blows my mind a bit. It really wasn't that long ago that letterpress was the accepted and common method of printing. It wasn't a quirky thing that graphic designers like... it was a common college major, and an even more commonly, a blue collar profession. However, I'm really okay with not being born in the 40's or 50's - because (as I realized when reading) I wouldn't have had the choice to be a printer. The book refers only to printers as being male. I suppose I often forget how different a woman's life was then. So, although I would love to be able to go to printer school - i'm happy here in the now, being a woman AND a printer. I obviously can't blog the entire text of the book (it's a whole lot of information) - but I will be sharing photos and excerpts here on the blog. I geeked out when we bought this book - things I learned only by hearing and doing are here in this book to be learned by reading and studying. It's not all universally interesting knowledge (a lot of it is super specific, which is super exciting to me, but i'm a nerd), but there's a lot to learn in there, and a lot to share. Hopefully reading it here will be helpful and informational for you, the reader. This book has been written with two aims in mind: to direct the beginning student in his learning about platen presswork; and to assist the advanced student or journeyman press operator to improve the efficiency of his techniques and the quality of the jobs which he prints. The task of beginning properly is important in any technical field; printing is no exception. The knowledge of basic elements that is gained by the printing student or apprentice not only affects the ultimate success of his learning, it also often determines his choice of an occupation within the industry. 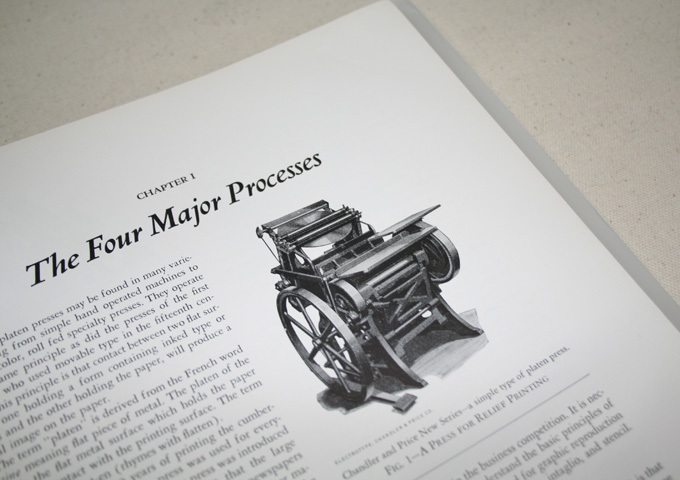 No one becomes a skilled pressman by reading a textbook about presses. Skill in presswork is developed by carefully supervised operation of a press along with a thorough study of the materials and equipment that a pressman uses. Until he has learned the basic techniques the beginner should work with simple jobs. As his skill increases, he may progress to more complex ones. Successful teachers generally make use of a series of jobs designed so that the student progresses from simple to complex work in an orderly manner, and in the process experiences each kind of job encountered in the average pressroom. The good pressman remains a student and observer all of his life. The things which he learns he adapts to solve specific problems and to improve the methods being used in his particular situation. Improvements in materials and machines are being made continually; these merit investigation in order that the competitive position of the platen press be maintained or improved against the inroads of other machines and processes.